Last week began the series of Monday myths. Today, I’m continuing that with a nod to a mythic figure of modernity–Luke Cage, a.k.a. 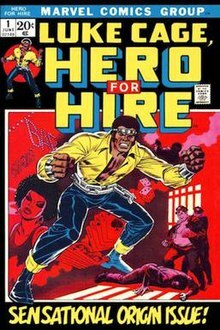 Carl Lucas, Power Man, and Hero for Hire. Below, I’ve listed other academics and pop culture fanatics who broke down the cinematic, anthropological, literary, and cultural impacts of this prominent character. I’ll be addressing his role as a heroic figure and champion of an oft-overlooked culture. Take the different origin stories for starters. In the original comics, Cage is a reformed criminal who gained his powers “voluntarily.” Admittedly, he at least verbally consented to the inherently unethical, highly illegal prison experiment which made him bulletproof. As a reformed criminal, he uses his new abilities to make a living as a “Hero for Hire.” In the Netflix adaptation, Carl Lucas is a framed police officer. Either way, Carl Lucas escapes after his murder attempt and becomes Luke Cage. There’s some great symbolism in his becoming Cage even after he left one. There’s a knowledge that all of his power brings its own kind of prison. In the cinematic mythos of the MCU, Luke Cage is part of the next wave of superpowered folks to emerge, following the Avengers’ Battle of New York. Cage is a resident of Harlem, which begets much of the character’s sociocultural contributions as a comic book or live action character. The character of Luke Cage came about in response to popular blaxploitation films at the time. That aside, this makes him the first black superhero. I’m not going to analyze the comics as that could fill a book. I will discuss how the Netflix adaptation, along with Mike Colter, the actor playing Cage, and Cheo Hodari Coker, the series director. Coker and Colter both admit how the Netflix series has liberated black culture in visual storytelling. With its myriad of references to prominent historical figures like Crispus Attucks; literary greats like Langston Hughes, Walter Mosley, and more; and the rich tapestry of musical accompaniment from hip-hop kings to rap stars, old and new. As a television series, I certainly found it rewarding various categories. I highly recommend the some of my references if you’re personally interested in the cinematic, musical, cultural or historical elements of the show and characters, I highly recommend it. I’m largely concerned with storytelling and mythic structure. I’m analyzing a character in an adapted context, outside of one particular narrative. The TV series incorporates several characters and the subsequent adventures of our hero. To realistically complete any comparisons, I’ll be using Campbell and Jung’s hero archetype. Luke Cage has most in common with the classical hero out of the alternatives. The other types, which we will examine in future posts, are epic, tragic, unwilling, and antihero. As a classic hero, Cage is subject to a few rules which overlap with the Jungian hero archetype. Typical traits of a classical hero include divine heritage or supernatural power and relatability issues. The archetype expands on this a bit more as we’ll explore below. Carl Lucas doesn’t have an extraordinary birth by any means. His half-brother, the first prominent antagonist, does though. As an illegitimate child of an affair, their familial conflict sows the seeds of Luke’s major rival in adulthood. On the other hand, his birth as Luke Cage is extraordinary. Illegal prison experiments which don’t kill you are certainly few and far between. Upon the discovery of his father’s infidelity and his brother framing him for a murder he didn’t commit, Luke cuts ties with his family. Unfortunately, the only functional one in the family is his deceased mother. Luke moves into a barbershop owned by Pop, his adopted father figure. Later on, he moves in with whatever lady captures his heart. Pop’s murder pushes Luke to involve himself in the local turf wars of Harlem. He’s forced to tangle with his family. He also confronts corrupted childhood friends. His quest explores the stereotyped paths to for success in black culture. Where one villain openly deals in gun-running; another happily commits murder for territory rights; and the most tragic, a woman from a crime family trying to better her neighborhood, through the use of blood money. Although we’re well aware of Luke’s bulletproofing and heightened strength, he doesn’t fully explore his powers until on his quest. His costume is traditionally outlandish. Modernity doesn’t allow for bold, barefaced heroics unless you’re an Avenger. Although the original costume has its own flair, the much subtler bullet-riddled hoodie makes its own statement. Immersed in the violence of warring gangs, a corrupt crime family, and those seeking revenge on his escape, Luke is the poster child for so much of the violence which occurs in impoverished neighborhoods. As Coker and Colter admit, he’s not just a hero for the black community. He represents all groups targeted for discrimination. He stands for those misrepresented persons by reminding the audience that being bulletproof isn’t the only power in his arsenal. His ability to keep a calm head and subdue opponents, instead of maiming or killing them, sets his apart. He’s not unrelatable just for being practically invincible. It’s the sheer force of character which makes him heroic. The first season of the show maintains Cage’s innocence. He forgives his fratricidal brother. He makes an uneasy peace with the villains in Harlem. He falls in love with a decent woman. He makes an established connection with the police and aims to keep the same “Switzerland” first installed by Pop. With the defeat of his brother, another villain takes his place. The first season ends with Luke wounded by a bullet, proving his vulnerability. The second season finds him returned to health and on the prowl for revenge. Where he once sought peace, he began to sow turmoil. His vendetta for retribution pushes away his love interest and forces him to search elsewhere for support. The second season sees two antagonists, although one is somewhat of an antihero. The primary antagonist is a true villain who cares naught for laying waste to the neighborhood on the premise of revenge. He’s rapidly replaced by the once noble-hearted woman, now turned evil with hatred. She’s essentially a foil for Luke’s descent into revenge, where she comes out the worse for wear. After forging new allies and being mortally wounded, again, he begins to mend the damage he made while on the warpath. We see Luke’s return to a decent relationship with his father. In the final battle of season two, his father actually participates alongside him. Luke reaches a point of no return in this second season. Prior to the series cancellation, our hero set out on a journey to “find himself.” This quest resulted from atonement with his father, as well as his friendship with Danny Rand, his personal spiritual guru. He’s made peace with family, police, and friends, but must now find peace within. Backe, Emma, and Astrid Countee. “Luke Cage: A Marvel Take On Black History”. The Geek Anthropologist, 2017, https://thegeekanthropologist.com/2017/02/08/luke-cage-a-marvel-take-on-black-history/. Betancourt, David. “Inside The Making Of ‘Luke Cage,’ Marvel’s First Black Superhero Show”. Washingtonpost.Com, 2016, https://www.washingtonpost.com/news/comic-riffs/wp/2016/09/27/inside-the-making-of-luke-cage-marvels-first-black-superhero-show/?noredirect=on&utm_term=.7669ab4bd0e4. Accessed 4 Feb 2019. Dietsch, T. J. “Black History Month: Luke Cage | News | Marvel”. Marvel Entertainment, 2017, https://www.marvel.com/articles/comics/black-history-month-luke-cage. McKenzie, Joi-Marie, and Rachel Scott. “Mike Colter Says ‘Luke Cage’ Isn’t A Black Superhero”. Good Morning America, 2018, https://www.goodmorningamerica.com/culture/story/shoulders-mike-colter-talks-luke-cage-black-superhero-53114638. Teutsch, Matthew. “Luke Cage And The African American Literary Tradition – AAIHS”. Aaihs.Org, 2016, https://www.aaihs.org/luke-cage-and-the-african-american-literary-tradition/. Vick, Megan. “How Luke Cage Built The Gritty And Complex World Of Netflix’s First Black Superhero | TV Guide”. Tvguide.Com, 2016, https://www.tvguide.com/news/luke-cage-season-1-preview-cheo-hodari-coker-interview/.